Andy Murray’s Surgery, your BPL Update, Kyle Lowry’s Nasty Fall and more! A Photo from Andy Murray’s Melbourne Hospital bed yesterday morning via his Instagram page as he recovers from Hip Surgery. British Tennis star, Andy Murray had a successful hip surgery and targets return in time for Grand Slam tournament, Wimbledon in July. Athletes in the NBA have been plagued with many injuries within the past year. The Star Forward for the San Antonio Spurs, Kawhi Leonard got injured in a game they won versus the Phoenix Suns last Friday. He has a partial tear in his Left Shoulder and sat out Sunday night’s game versus the Trail Blazers, which they lost 110-111. They bounced back without Kawhi last night and beat the Sacramento Kings 107-100. While Point Guard, Isaiah Thomas (IT) has returned from his Hip injury to his new team, the Cavaliers and had a good start until last night versus the Timberwolves. The Timberwolves headed by Jimmy Butler and Anthony Wiggins, is a team to watch this year from the West. IT clotheslined Andrew Wiggins in the 3rd quarter when the Cavs were down 52-82, resulting in his ejection from the game. It is still questionable how many minutes IT can play in games and if his hip will last until the end of the season and the Cavs’ possible run in the Playoffs. Another highlight of the game was when Tyus Jones of the Timberwolves got revenge with a huge dunk on LeBron James. The Timberwolves restricted LeBron James to a season-low of 10 points to win the game with an impressive 127-99 points. The biggest story of last night though was a sad one. Kyle Lowry of the Toronto Raptors was out for a while last year with a wrist injury, also taking him out of the MVP race. After his return, playing like himself again, he had a nasty fall versus the Brooklyn Nets in OT and had to be carried off the court. The Raptors still outlasted the Nets 114-113. Prayers go out for Kyle Lowry with the hope of a quick return. Celtics at Spurs TONIGHT on ESPN! Let’s not forget that the 2017-2018 NBA Season is off and poppin’. CELTICS @ SPURS Tonight at 9:30pm on ESPN! What’s Going on in the NBA and Who’s Making it to the Finals?! First of all, Suga would like to Congratulate Dirk Nowitzki of the Mavs for joining the 30,000 points club and being the 1st International Player to do so. He joins Kareem Abdul-Jabbar, Karl Malone, Kobe Bryant, Michael Jordan and Wilt Chamberlain. Who is the closest NBA player in line to try and join the club? LeBron James. He may take about 63 more games to do so based on average points per game. Other players are way off with hundreds of games more to go. Now to the meat of the matter. It’s almost Playoff time and teams on the chopping block are striving for every win they can get. How are The Finals looking? Suga believes the Cavs are going straight to the Finals again. The teams on the East continue to be weak and King James and the Cavs are just too good right now. Despite their last 3 consecutive losses, they turn it up when they need to. The closest contenders, currently a close 2nd in the East are Isaiah Thomas and the Celtics. They beat the Warriors Wednesday night without KD but they aren’t consistent enough. They should give the Cavs a run for their money though. The main concern for the Cavs has been not enough time to rest their star players. The plan to do so got a dent with them obtaining Warriors’ Andrew Bogut. He’s so fragile. Bogut fractured his tibia within minutes of his team debut and will be out for the rest of the year. Kevin Love is still out and J.R Smith is just returning after an injury to his finger. However, they added Deron Williams and Kyle Korver. Coach Lue has already started to implement a system to trim minutes for Kyrie Irving and Tristan Thompson whose defense game has stepped up majorly this year with 70 blocks and he still has more games to go this season. Oh and yes I said it earlier, King James. The rain is going to pour and the gates are going to open because I have finally put some ‘respek’ on his name and anointed him. Timing is everything though and he anointed himself before his time, that is, before he even got a ring. I still do not think he is better than MJ, so let us not get carried away folks. If and when LeBron and the Cavs reach The Finals this year, it would be LeBron’s 7th straight Final! I’m sure everyone would agree that is quite commendable. There may be many times he may not be able to hit the game-winning shot and a lot rests on Kyrie but Kyrie and the team could not keep winning without him. The best players are usually arrogant but they aren’t usually babies crying, falling to the floor and begging for calls from the Ref after every little hit or shove. So quit being a baby LeBron and you will get some more respect from Suga. The Warriors have acquired Matt Barnes but at the same time have lost Harrison Barnes, Andrew Bogut, Festus Ezeli, Leandro Barbosa and Marreese Speights. They therefore have no BIGS in the paint. The Splash Brothers are no more because Steph Curry and Klay Thompson no longer play in sync as they used to and they are not unstoppable. Both Klay and Curry have been very inconsistent with scoring and something seems off with the overall chemistry of the team. Even with Kevin Durant (KD), Suga doesn’t see a Super team. I see a weaker team. Hold up, I should say without KD because right now KD is sitting it out with a Grade 2 MCL Sprain after his teammate, Zaza Pachulia fell on him while his knee was hyperextended in a game on February 28th. Grade 2 MCL Sprains normally take about 6 weeks to heal but the Warriors say he will be re-evaluated in 4 weeks and could return before the end of the season. Following KD’s injury, the Warriors suffered back to back defeats, which hasn’t happened since 2015. They suffered back to back losses again Wednesday night after they lost to the Celtics. KD was shooting the best in his career and led the team in points and rebounds per game. Sadly he can no longer be in the race for MVP because of his injury. Suga thinks karma will come around to bite KD for going to the Warriors and all the players they sacrificed just to get him will go in vain. If not the Warriors then who? The San Antonio Spurs of course. They are currently in 2nd spot close behind the Warriors. They had a tough loss against OKC last night, especially when Kawhi Leonard had to go to the Locker room after getting hit in the head. They weren’t themselves last night but you have to keep in mind they were on a 9-game winning streak. They play the Warriors tomorrow night at 8:30pm! Once the Spurs play to full potential they are quite hard to beat. This was proven on Wednesday night when they beat the Kings after overcoming a 28-point deficit with both LaMarcus Aldridge and Kawhi out resting. That win showed their Coach, Gregg Popovich all fired up. A sign they are going for that #1 spot in the West. Also note that with veteran Gasol, Aldridge and Kawhi, they have BIGS in the paint. The Spurs clinched an NBA record with their 18th straight 50-win season on Wednesday night. LeBron is in the race for MVP with James Harden of the Rockets, Russell Westbrook of OKC and Kawhi Leonard of the Spurs. It depends on how they define MVP but Suga thinks all roads lead to LeBron James for MVP, the Stats King. To break it down briefly, let’s look at LeBron vs. Harden. LeBron has better numbers from the field and 3-point line over Harden. He is actually better than KD and even with Steph Curry at the 3-point line. Let’s not even talk about Harden’s record for turnovers this season. Rockets’ defense improves when Harden is off the court. No MVP for him this year. Despite averaging 0.4 points more per game than LeBron, Leonard is a less efficient scorer. He shoots 5.1% worse from the field and 1.3% worse from the 3-point line. Kawhi is known for his strong defense but surprisingly, the stats show that the Spurs are better defensively without him on the court. Since the stats show that Rockets and Spurs do better and/or still win with Harden and Leonard off the respective teams, that rules them out for MVP in my books. That now leaves LeBron vs. Westbrook. Kudos to Westbrook for not crumbling after a bad break up. He has shown tremendous effort and focus in every game he plays and as a result, has led OKC to a spot they are likely to keep or move up by one to head to the Playoffs without KD. He does not have a good team and regardless of if they miss shots or good opportunities he hasn’t cursed them yet. He has shown he has prepared mentally for each and every game. Steven Adams, Victor Oladipo and Enes Kanter showed their potential last night in a win vs. the Spurs. When it’s Playoff time, could OKC rise a dark horse? We’ll see because that was just one game and they played versus the Spurs’ bench in the 4th. This puts us back to the MVP race between Russ and LeBron. Last night Russ tied Wilt Chamberlain’s record of 31 for the 2nd most Triple-Doubles in a season. Congrats to Westbrook but LeBron’s shooting is still better at 53.8% vs. 41.9%. LeBron is first for Field Goal Percentage in the league and Westbrook is way behind. LeBron is universally accepted as the best NBA player in the world and the fact remains that when LeBron takes a breather, especially if Kyrie’s game isn’t on point, the Cavs fall flat. The same occurs with OKC without Westbrook. The difference? The Cavs are an excellent team with LeBron and OKC is a good team with Westbrook. Excellence wins the race and so may LeBron for MVP. Let’s see how it all plays out. Don’t you just love this game?! The NBA Playoffs is on fire! Why are the Spurs losing to OKC? The Cavs await the Raptors or Heat for the Eastern Conference Finals after sweeping the Hawks. The Raptors-Heat series is drawn 2-2 and they will play in Toronto tonight at 7pm. The Heat players have been plagued with injuries but they still managed to level the series. Can D-Wade win it for them again? The Warriors should beat the Trail Blazers in California tonight at 9:30pm to advance to the Western Conference Finals. They will await the winner of the Spurs-OKC series. On Sunday, Durant came alive in the 4th quarter, the Spurs fell apart and KD won the game for his Momma, who is the real MVP. OKC leveled the series at 2-2. They headed back to San Antonio for a crucial Game 5 last night. OKC led the 1st quarter 22-16. Then it was all about the Spurs for the 2nd and 3rd quarter. But in the 4th, putting bad calls aside with acrobatics from Steven Adams and Westbrook swatting imaginary flies from his eye saying he was hit by Parker, the Spurs failed to make crucial shots. In particular, Aldridge and Parker. They went cold. While on the other side, Westbrook was hot and unstoppable. His athletisism was impressive resulting in steals and speeding through the paint. His last steal, then the and-1 in closing seconds sealed the deal for the Thunder’s Game 5 win over the Spurs. Westbrook ended the night with 35 points, 11 rebounds and 9 assists. 81% of the time, whoever wins Game 5 usually advances in the series. With Spurs’ performance during the season, they would have been expected to beat OKC. But it’s always about match ups. OKC has always been a serious threat to the Spurs. They lucked out with Ibaka’s injury the last time they met in the Playoffs. Now Ibaka may not be as much of a threat, but Westbook is unstoppable. When he is guarded by Kawhi, Durant will take care of everything else. If they happen to lock down those two, there are Waiters and Steve Adams who will do the job. Steve Adams’ game has improved tremendously. Someone should cut his hair. Old man river walk, Tim Duncan has to be present for the Spurs’ defense and to get crucial rebounds. Diaw is not playing as well who used to be a key part of the Spurs’ defense and facilitator for plays and magical ball movement. Danny Green works hard but is not where he needs to be yet for defense, then the Defensive Player of the year, Kawhi Leonard can’t do it all on his own. Ginobili is a ticking time bomb. Parker crumbles under pressure. West makes too many unnecessary fouls and Aldridge fails to make clutch shots. Leonard and Aldridge want it but the rest of the team seem comfortable with their previous rings and accomplishments. Let’s hope some desire to move forward is ignited and they can force a game 7. Either way, the Golden State Warriors will beat whoever emerges as the winner and beat the Cavs as well, who will reach the Finals, to start their dynasty. Steph Curry is back and he came back scoring 40 points, 17 of which were in overtime. Or can OKC just upset everybody? They surely look hungry. Let’s watch and see. Congratulations to the 5-time NBA Champions, the San Antonio SPURS !!! Congratulations to the San Antonio SPURS for their 5th NBA Championship title in franchise history, joining the Celtics, Lakers and Bulls as the only team to accomplish that feat. 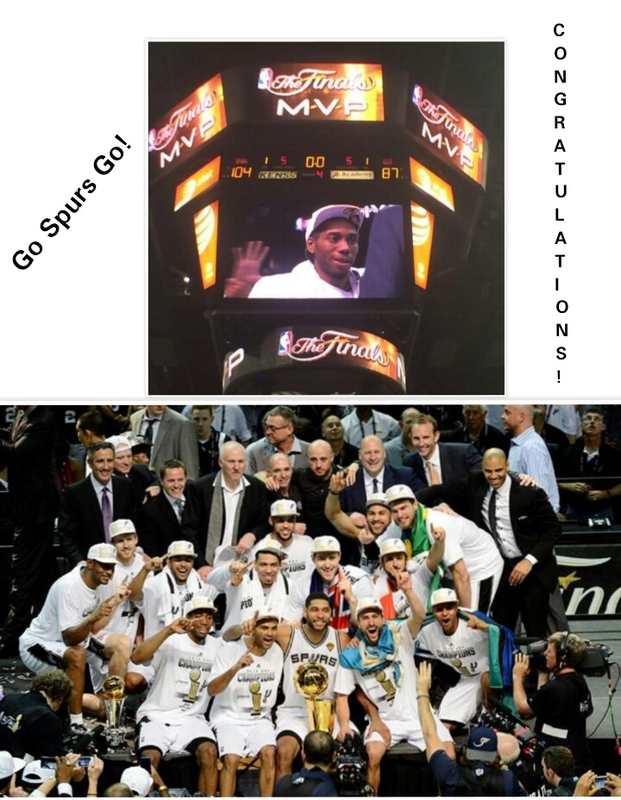 The Spurs won the series 4-1 last Sunday night in blowout fashion with a final score of 104 to the Miami Heat’s, 87. LeBron James had a blazing start in the first quarter and ended with a commendable 31 points, but nothing could stop or stand in the way of the Spurs achieving their redemption title as it slipped through their fingers last year. This rematch was also a big hit with television viewers compared to last year. The unselfishness, teamwork and ball movement of the Spurs was phenomenal with superb execution. All players made a significant contribution to the title, however out of so much talent, an MVP had to be chosen, young Kawhi Leonard who scored 22 points in the final game. Imagine what he could have done if he wasn’t in foul trouble. Special mention also has to be made to veterans Tim Duncan, Manu Ginobili and Tony Parker. Tim Duncan is now the all-time Double-Doubles leader in NBA Playoffs history passing Magic Johnson and also passed Kareem Abdul-Jabar to set the all-time record for most minutes played in play off history. One word, GINOBILIIIIII! Manu redeemed himself majorly after 2 years of horrible inconsistency, but showed everyone how hard he is on himself and how much of a true competitor he is by both facilitating unforgettable plays and scoring huge necessary shots. Tony Parker had his ups and downs this season and didn’t even score until the 4th quarter in Sunday’s game, but once he started scoring he was on fire. His style of play and speed is always a beauty to watch and he said this was the sweetest victory for him yet. So what’s next?! According to Tony Parker and Owner, Peter Holt, the Spurs should be back to try to defend their title next year. Tim and Manu may play until they die. Gregg Popovich would also like to coach beyond this year. Congrats to him as well for an excellent season, many years of great coaching and the ability to bond with all players. The relationship Pop has with the Spurs is on a different level compared to other teams. So until next year, Go Spurs Go!